Last May 5th, I interviewed OVSD trustee board president Gina Clayton-Tarvin at the “Put a Lid On It” rally held at Oak View Elementary. It was an agreeable conversation that ended with us making plans to tour Rainbow/Republic together the next week. My follow-up calls/emails to set up the tour a couple of days later were ignored. He followed up with: “She told me she was terrified.” Terrified? I alerted Clayton-Tarvin that something strange was going on. She ignored my messages. I re-read the Daly message. “She told me she was terrified.” Daly was quoting her. Was she the one behind this? 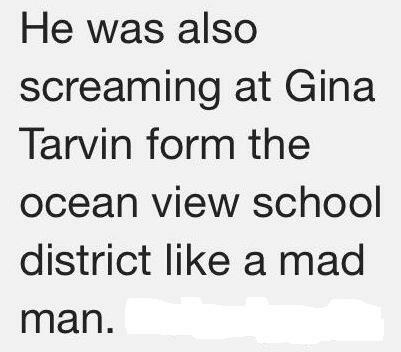 A “mad man?” And then Daly shared a photo, secretly taken by Clayton-Tarvin friend (and Golden View PTO President) Jodie Merkle. Someone had captioned it and evidently, based on feedback I received, it was being distributed, widely, to others in the school district and the community. A smear was taking place. Her child was frightened and ran away? Both my son and I met Ms. Clayton-Tarvin’s son that day. In fact she introduced us all. Nobody had run away from anyone. This was getting crazy. Was she behind this? Daly was not even at the event. Where was he getting his information? 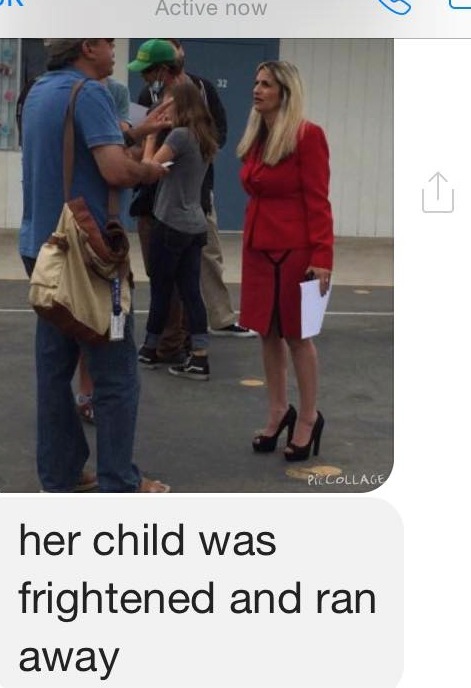 Then, October 21, a moderator for the OVSD Facebook Forum shared these messages (among others) with another moderator after indicating in the message thread that he’d just had a phone call with Clayton-Tarvin. These messages were shocking to say the least, and were connected to the May 5 rally. I checked with the HBPD–no group of officers had been sent to the rally in regards to myself and HB resident Craig Frampton. (I’ve also written to OVSD lawyers to see if they are part of this, as they are also accused in the above exchange. So far no response). I had certainly in my life never harassed or stalked anyone–Gina or anyone else. That was an outrageous lie. 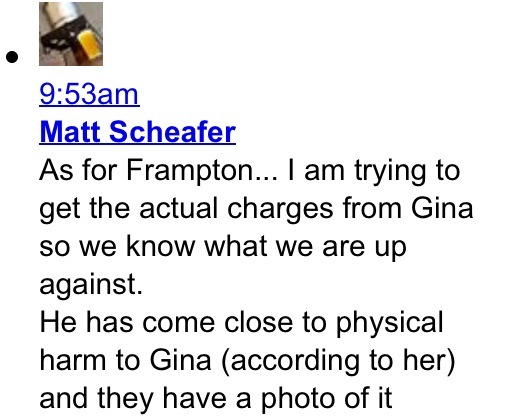 And if Craig Frampton has ever come close to physically harming Gina (note the words–“according to her”) then I’d like to see the photo they claim to have. 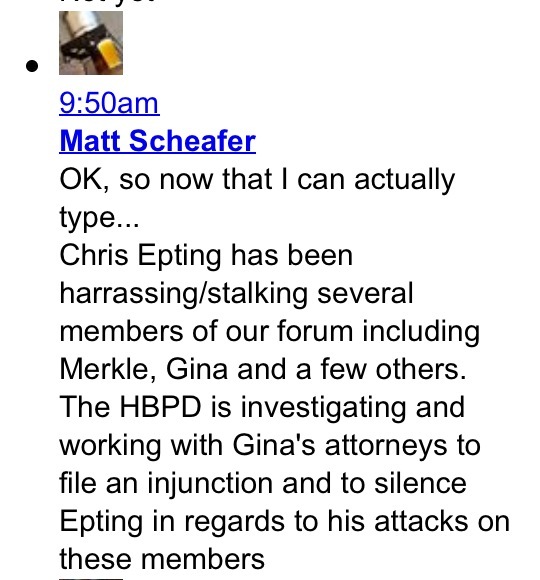 To suggest that Schaefer would make all of this up (and more) seems all but preposterous. Based on earlier conversations between the two of them that have been shared with me, he clearly respects Clayton-Tarvin. And this was not the first time she stepped in to, what seemed like, apply pressure to how the group is run and who should be allowed to express themselves. In my opinion, this was simply an attempt to intimidate and manipulate an abuse of power based not on any truth, but an agenda. This was getting out of control. So I wrote about it. 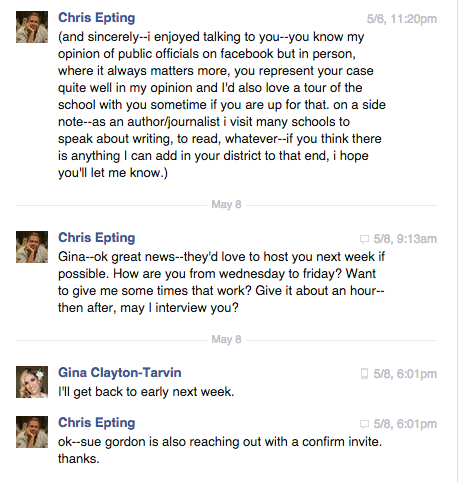 I also contacted Clayton-Tarvin several times privately, asking her what she knew about all of this. I’ve yet to receive an answer. But I did receive a slew of peculiar accusations and questions from supporters and/or friends of Clayton-Tarvin. Again, the picture was being cited as evidence of her being attacked in some way. Who was feeding this information to people that were not even there? To me it seemed obvious. 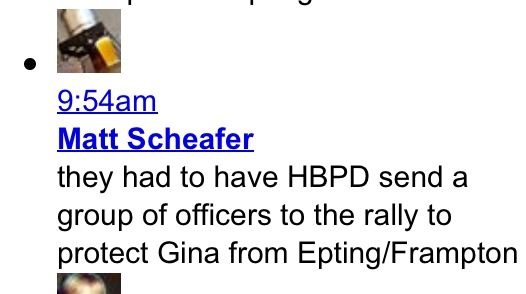 “…you said that Gina greed to be recorded when you spoke at the rally. She said this was completely not the case.” She can keep telling people that (as I’ve heard she is). But it is not true (and a non-family witness present has said they would swear under oath if need be that Clayton-Tarvin agreed – and his voice is on the tape after the interview, establishing his presence). As I explained online, the weeks leading up to the rally featured much verbal sparring on line between Clayton-Tarvin and others, including myself. The sudden and intense presence of an elected official on social media got my, and others attention. So I wanted to ask some questions. After arriving at the rally, mingling with some teachers and catching up with some friends, I interviewed OVSD lawyer Ed Conner and trustee John Briscoe before talking to Clayton-Tarvin. And I asked all three for permission to record I’ve done hundreds of interviews as a writer–I’ve NEVER not asked permission. Ever. Why? Because it’s illegal to record a private conversation without permission, and would also utterly violate every journalistic protocol. And–if that were true–why would she talk to me as she did, even indicating at one point that it was good I was getting a specific point “on the record?” When I introduced myself to Clayton-Tarvin she seemed fine, relaxed and right away introduced me to her son (and I introduced her to mine). Nobody yelled or ran away in terror. Interviewed herself last week for another local blog, Clayton-Tarvin commented on the event, saying I was talking”really loud” and that she was “not used to being talked to like that.” Again the Merkle photo was used. You may now listen to the interview yourself (and read the transcription) to decide if it sounds like she was “terrified” and being “screamed at,” as Michael Daly stated as fact. Or if she seemed like she “didn’t want to be recorded.” Then ask yourself why she might be spreading all of these lies about the interview, for all these months, among her friends and followers. Why would she use people like that, knowing exactly what had taken place and that we’d actually talked about doing something positive for the community? CE: How you doing? This my son right here. CE: Gina, Mr. Briscoe was talking to day about real health concerns at this event. Why are the kids still here? What can be done, if it’s that serious, why aren’t they being moved somewhere? CE: If you had somewhere to move them you would take them somewhere? GCT: I think the thing is is right now we don’t have a (hard to decipher) school, for several reasons, and the thing is that there is still cement over there and Republic was told that we wanted them to completely take away the cement. And they wouldn’t do it. We asked at the hearing at the Orange County Health Care Agency if they would condition their permit and agree under their permits never to crush cement again and they refused. CE: Have they offered to enclose fully yet, do you know? CE: Sharing that fact on line that hey walked away–what’s the appropriateness–I know things get heated on line–but when you go on there and share information like that–I mean, do you regret that at all? GCT: No, I don’t. Because it’s the truth. I don’t regret the truth. CE: Well there’s lots of truth you could tell. But you’ve go to be selective about what you share, right? GCT: That’s something that is a known fact. That’s not disclosing anything that’s confidential. CE: You lawyer. Ed (Conner) told me that he’s been encouraging you to do this, that it’s kind of a campaign to get out and be public. Did you work together with him on this, this idea of being public? GCT: No. I don’t know what that means. CE: That’s what he said, that he’s been all behind it, it’s been coordinated and he’s encouraged you to do things like that. GCT: Well I don’t know what he said. All I know is what I know to do. I’m a person that advocates for children, I’m a person that will tie this seriously–and it is–it’s a serious problem–it’s a nuisance–and that’s what our lawsuit says. It’s a nuisance and we want it abated. That’s all. We don’t want to shut them down. You know? CE: And you’ve said there’s nothing punitive – you want it enclosed with nothing else, right? CE: How concerned are you from a health standpoint for the kids here? CE: Are they monitoring–is the AQMD monitoring here yet? CE: What have they found? GCT: You’d have to ask them that. You need to talk to them. They’ve written up several violations. CE: They’ve monitored at this school? GCT: They’ve monitored over there. GCT: They don’t monitor schools. They monitor the actual dump. So you can call them, they’ll give you the information. GCT: Or Mr. Connor can send you the data then you can call AQMD. CE: Do you know why OV wasn’t here today; why this is union sponsored? GCT: What Ocean View wasn’t here? CE: Why was it a union sponsored event versus Ocean View? GCT: Well because it’s against the law for the district to sponsor an event like this because that would mean we’re spending public funds and you we absolutely would never do that. So, the teachers union took it upon themselves because this is about their working conditions, this is about the health of their students, the teachers number one concern is to advocate for their students, that’s what we do–you know I’m their spokesperson. So that’s really it. It’s against the law – the district can’t have anything to do with it monetarily. CE: That’s why they weren’t involved today? GCT: Yes. That’s the reason. The superintendent can tell you about it. He’s the official spokesperson on that. CE: Lastly, have you been over there lately? GCT: They won’t allow me to come on site. CE: Do you wanna go? CE: I appreciate your candor. CE: Wouldn’t let you on the property? GCT: They would not let the district on the property. And I represent the district. CE: What was the reason? GCT: Because, they just said “No, you’re not allowed on,” so we had to go to court, we got injunctive relief and they were fined $5000 for the refusal to let us on the property. CE: Did you go on after that? GCT: I didn’t go but the superintendent and the lawyers went, some of our experts went and they finally let them on after they were sanctioned $5000 and the judge demanded that go on, so – why? Just come on! If you want to be good neighbors just let us come over! We let them come over. What’s the big deal?! CE: Last question, too–in terms of good neighbors–they put money into the library-do the kids here know what they’ve done? GCT: Yes they do. The children know. GCT: The balance is this: they do fund programs and things for the students but not directly through us, they do it through the city and different things–and you know what? I appreciate that. I want to be good neighbors–I want to work with them. That’s why I keep saying to Sue (editor’s note–Sue Gordon, Rainbow/Republic spokesperson), Sue, lets sit down! I’m not opposed to doing that. If Sue Gordon wants to meet me tomorrow, I’ll take the day off work and go sit down with her. CE: I’ll tell ya right now, let’s do something next week. Let’s make that happen. GCT: I think it would probably be ok. I don’t see why not. I will ask my level counsel, but I’m sure it will be. CE: It will all be strictly–they (counsel) can go too if they want. I don’t want to peak for Sue…. GCT: I do, too. I agree. CE: If nothing else, it would put out something positive. You up for that? GCT: Thank you so much. Thank you, Charles. Nice to meet you. CHARLES EPTING: Nice meeting you. 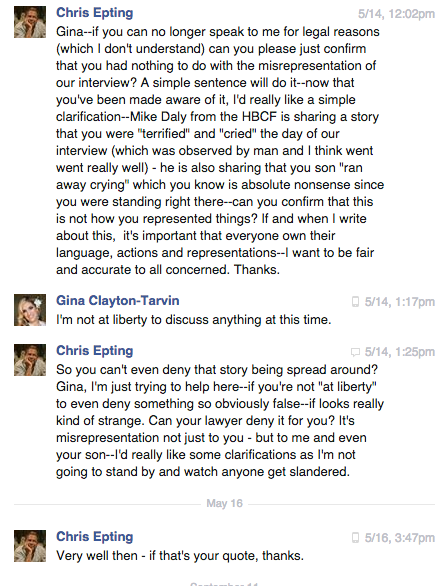 And that sentence– “I’m not at liberty to discuss anything at this time” on May 16 was the last response I’ve ever had from Gina Clayton-Tarvin. 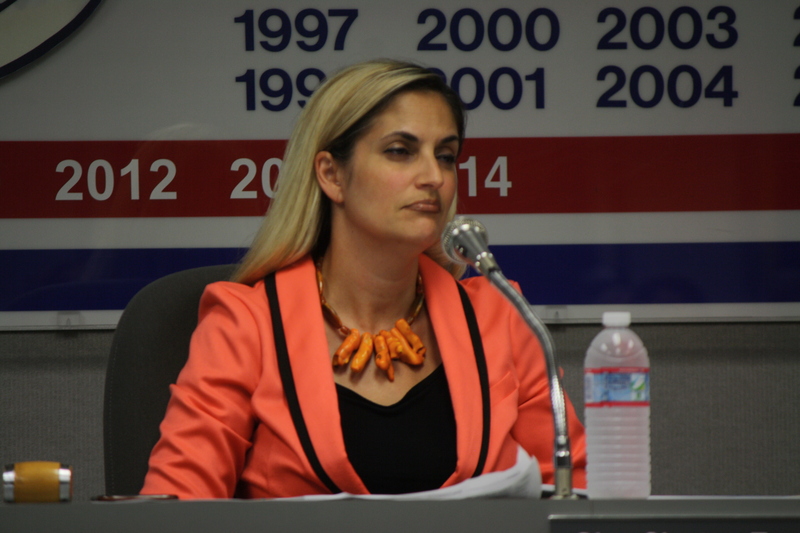 No denials, no explanations–no nothing from the president of the OVSD board of trustees. So with that my story idea hit a dead end. In exposing these lies, I’m left wondering what is driving this seemingly relentless attack upon myself (and now others.) Is it because I dare to ask questions without simply buying one-sided propaganda? Perhaps that has become inconvenient for them. I don’t know. 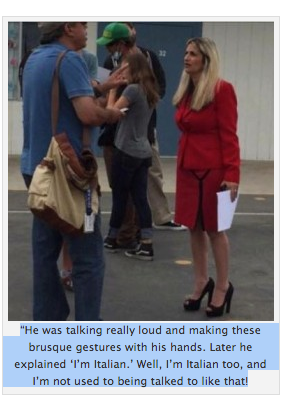 In the meantime, if you’re concerned about your taxpayer time and money being spent as it appears to be by using others to attack people and trying to intimidate people in general, you may let the OVSD trustee president know by writing her directly at: mrsclaytontarvin@gmail.com. In my opinion, *everything* she says about local issues now needs to be heavily scrutinized, given what appears to be happening here. She won’t answer me. Perhaps she’ll answer you. What I don’t understand in all this mess is why these people are so behind a school board/district that hasn’t done much to get their school fixed from the asbestos mess. Why not question all that instead at this point? Why fix Hope View over Oak View or Lake View even? I would think that is something that should have been asked by that area. Is putting the Rainbow issue out there as they are, a way to make us try to forget the mess they created during the last school year? Well I haven’t forgotten it. I know others haven’t either. Yet those questions still have never been answered when it comes to that issue that we have all had. This district has been a joke for so many years now and has just gotten worse over time. Makes me even happier that I pulled my child from it and went to home schooling instead. Wow wish I read this before I voted ! Curious who you are voting for?